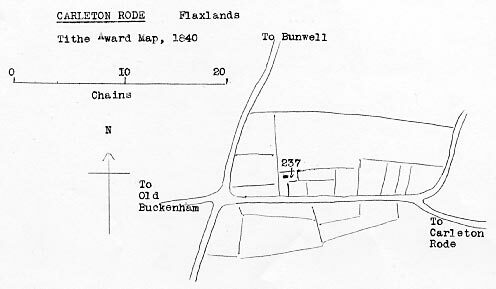 To be Sold by Auction by Mr. Butcher at the Adam & Eve Inn, Carleton Rode on Tuesday 3 September 1844 at 2 o'c. A Brick & Board TOWER WINDMILL (erected about 12 years since) with three floors, & driving two pairs of stones. Also a Dwelling house, Stable, Cartlodge & well planted Garden containing about half an acre. Freehold. Land tax 4s. per annum. The above Premises were late in the occupation of Mr. Ringer deceased & immediate possession may be had. Particulars of Messrs. Blake, Keith & Blake & of Mr. Durrant, Solrs. & of the Auctioneer, Norwich. Map 1839 J. Eaton, Surveyor, Old Buckenahm.